I'm currently on the road in northern Thailand doing research for Lonely Planet's Thailand guide. I’d love to blog on the food up here as often as I did during my previous tour of duty back in 2009, but am really pressed for time and will most likely have to keep it to a handful of standout dishes and restaurants. Alerted by EatingAsia as to the presence of a previously unknown noodle dish in Chiang Khong, I kept my eyes peeled while recently in the riverside town. 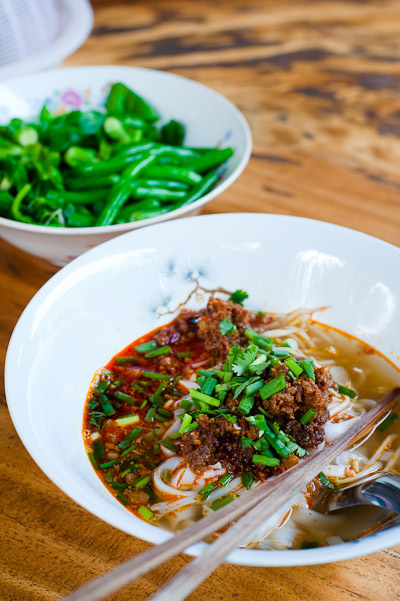 While most Thais associate khao soi with squiggly egg noodles and a curry broth, the residents of Chiang Khong have an altogether different idea of the dish. 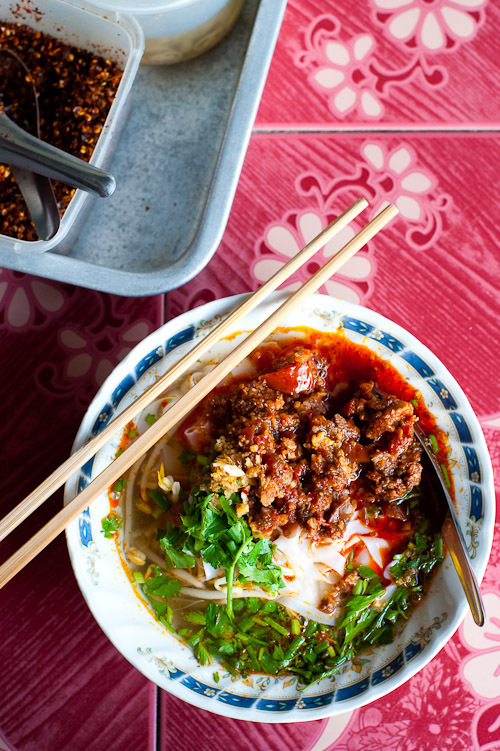 Referred to locally as khao soi nam naa, the dish combines rice noodles served with a clear pork broth, the whole lot topped with a dollop of a thick tomato and minced pork mixture. This dish has become so synonymous with khao soi in Chiang Khong that the other version is called khao soi kathi, 'khao soi with coconut milk'. Following EatingAsia’s lead, I sought out a stall selling the dish in one of the town's side streets. Upon seeing it, I realised that I’d actually encountered khao soi nam naa (or something very similar to it) previously, in Mae Hong Son, Laos and Myanmar. In Mae Hong Son and Myanmar, I seem to recall that the noodles took the form of round toothsome strands possibly made from tapioca flour, but here the dish was served with a flat rice noodle. 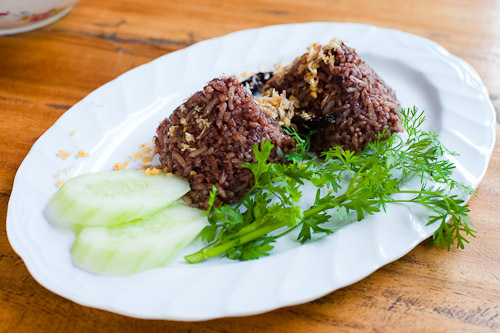 The minced pork itself was dry and almost crumbly, and was held together by the paste-like mixture of chili, tomatoes and other spices and herbs. The dish was salty even for my taste, but otherwise was balanced and tasty. She claims that her mother, an ethnic Dai/Tai from Xishuanbanna, southern China, brought the recipe from her homeland, suggesting in my mind a pan-Tai link for this dish. Served in huge bowls, I really enjoyed Pa Orn's version of the dish, particularly because it was served with a side of some of my favourite veggies. Again, the minced pork was almost dry and crumbly, but was held together by a similar red sauce, which in this case was less tomatoey and salty, but spicier than the previous bowl. Like the previous one, the dish was served with a spicy/salty condiment that was very similar in form and taste to the thick red chili paste one finds at Korean restaurants.